Costs – Find out what your neighbors in DeKalb, Illinois pay for their tree services. FAQs – Getting ready to plant a new tree or remove an old one? Check out the current recommended trees, city regulations and diseases affecting trees in the area, along with more important info for you as a tree owner. Services – Call a tree pro in your area today! How Much Do Tree Services Cost in DeKalb? Tree service professionals in DeKalb may be needed to handle tree removal or maintenance services. Rather than taking the DIY approach that might be taken for gardens or yard landscaping, managing trees may be dangerous to property if professionals aren’t on the job. Trimming, stump removal and tree removal are some such services. For a breakdown of costs for different jobs, consult this guide. Tree removal in DeKalb will generally cost in the range between $690 and $990. If a tree needs to be removed because it poses an imminent or medium-term risk to a power line or structure, it will cost more than if it needs to be removed because it is simply too big or aesthetically undesirable. The average cost of tree removal in DeKalb is $840. Removing stumps in DeKalb typically costs between $80 and $152. This is done through a process known as stump grinding, whereby a special piece of equipment is used to grind the tree stump into mulch and sawdust. This is much more convenient than pulling a stump out for two reasons. First, it won’t damage the lawn, grass or landscaping surrounding the tree, and second, it is typically much cheaper. There are instances where pulling the stump out is a better idea, though that will cost closer to $250 on average. The average cost of DeKalb tree trimming is $457. This may vary substantially, depending on the size of the job as well as how many branches the tree has, its height and what type of tree it is. Jobs include pruning, trimming and branch cutting. The average price range for trimming and pruning in DeKalb is between $382 and $532. DeKalb is located about 60 miles west of Chicago in the rolling hills of North Central Illinois. Trees and natural beautification are priorities in the relatively small city of around 40,000 people. However, with the desire for trees comes the need for people to help take care of them, and this is where the many tree removal services in the city come in. The Illinois State Department of Agriculture requires property owners sign a compliance agreement if they plan on removing an infected ash tree because the state wants to make sure that the owner disposes of the waste in a responsible manner. Proper removal is a high concern to prevent the spread of bugs if a DeKalb citizen is cutting down a tree within the Asian long-horned beetle quarantined zone. Beyond that, the regulations from DeKalb are relatively mild. For planting on private property, no application is required though the state strongly suggests that would-be tree tenders make the decision carefully based on height, drainage and maintenance concerns. For planting on public property such as on a public right-of-way, an application form must be filled out. 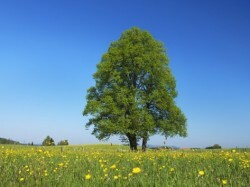 Only certain types of trees may be planted on a right-of-way. These include various maple, linden and oak trees as well as several other options. It is generally okay to grow trees near power lines in DeKalb, but it is the property owner’s responsibility to make sure that the trees don’t grow above 20 feet tall. 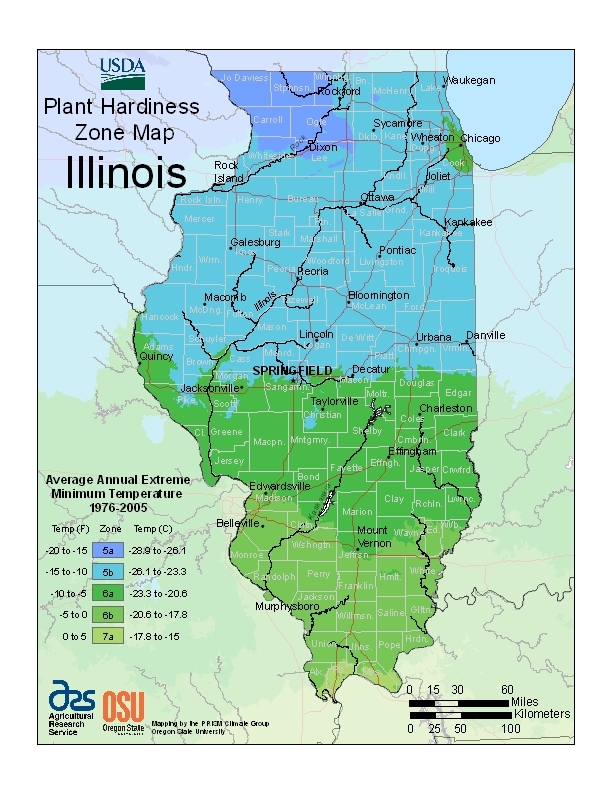 When it comes to closing down an orchard for the winter, DeKalb trees need to be well-protected, because the winter in Illinois can be bitterly cold. Trees should be removed well before the first frost, which is typically in late September or early October. Trying to pull up a tree after the first frost makes the job much harder than it has to be. By the same token, the best time to prune trees back is in the springtime right about the time of the last frost. Pruning helps a plant to grow in the right direction during the year, but it must be done before significant buds start to emerge. The state tree of Illinois is the Quercus alba or the white oak. Oak trees are important to the Midwestern ecology as a whole because they don’t need to grow in a forest canopy. 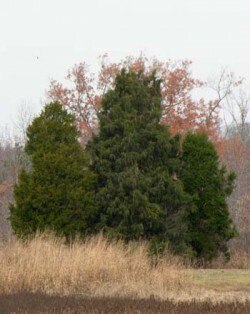 These trees can grow in the midst of prairie land and their crown can have a large circumference. They help to anchor the soil and keep it from being washed away by rivers. The white oak in particular has a distinct spreading quality that makes it iconic and noticeable from far away. Fruit trees that grow well in DeKalb include apple, serviceberry, pear and mulberry trees. The tallest trees tend to be the white pines or red cedars, and the shortest trees tend to be the fruit trees. The most common pests and diseases affecting DeKalb trees are the emerald ash borer beetle, the gypsy moth, Dutch elm disease and various fungal pathogens. Any citrus, tropical or semitropical fruit trees or will not make it very long growing in DeKalb. The winters are just too cold for flora such as palm trees. Trees with a hardier rating are the best trees to grow here. There are some temperate-zone trees that may also be kept here, but they must be properly tended and protected during the winter with mulch and smart watering practices to keep them from drying out.